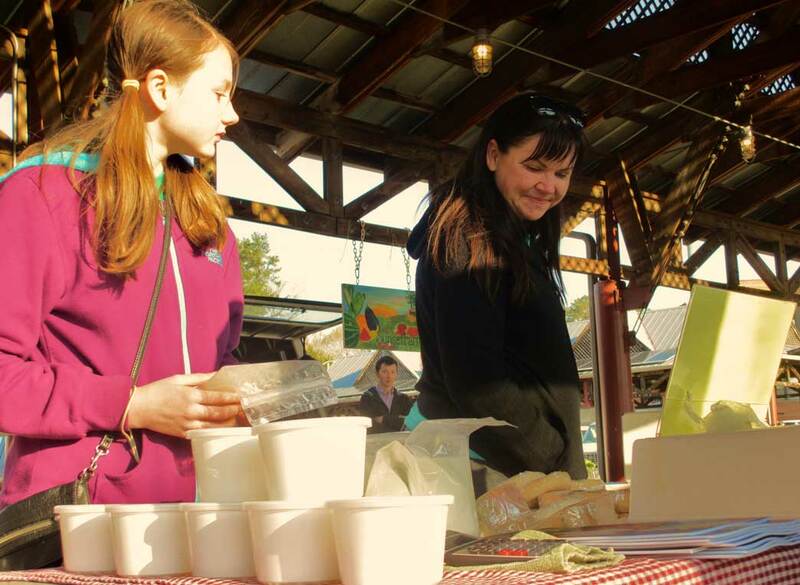 Dedicated shoppers trekked into the Carrboro Farmers’ Market two hours early this Saturday, April 6, to celebrate the market’s extended spring hours. It opened at 7:00 a.m. for the first time this season. Saturday’s Rise and Shine Opening Celebration treated shoppers to complimentary fresh scrambled eggs, biscuits and baked goods. Sheila Neal of Neal’s Deli in a food tasting event, and will be followed by a food truck rodeo. Market Coordinator Erin Heiderman smiles at the Rise and Shine Opening Celebration on Saturday. Heiderman says she’s expecting a good turnout for the Wednesday opening and food truck rodeo. Erin Heiderman, the market manager, said she’s excited about the change to the spring hours. Heiderman said she relies on a dedicated crew of volunteers to help run both the Saturday and Wednesday markets. Noah Balamucki, a junior at Carrboro High School, volunteered at Saturday’s market for the first time. Balamucki said it was an early morning for him, but he enjoyed the work. Jeri Ann Guth and her daughter Zoe were among the many shoppers who braved the early light and capitalized on Saturday’s extended hours. Jeri Ann Guth and her daughter, Zoe browse the market’s bread selection on Saturday morning. Guth, a Hillsborough resident, said she tries to support the local food industry as much as she can. Guth, a Hillsborough resident said she can’t wait for Wednesday’s market and food truck rodeo. As the featured guests for the Wednesday opening, Matt and Sheila Neal said they have been looking forward to the event. The pair who own and operate Neal’s Deli, of 100 E. Main St., will be sampling food that was cooked and purchased from the market. “We’re not entirely sure what all we’ll be tasting on Wednesday, but we’re excited,” Matt Neal said. He said he and his wife, Sheila Neal, are frequent shoppers at the market. Sheila Neal in particular has a connection to the Farmers’ Market, as she was once the manager. Sheila Neal said she especially likes the Wednesday market because it’s often a showcase for new vendors. Heiderman said the Neals were an easy choice as the featured guests. The food truck rodeo will begin at 6:45 p.m, Wednesday April 10, after the market closes and will feature five vendors from across Carrboro, Chapel Hill and Durham. Ten percent of the proceeds from the food trucks will benefit Farmer Foodshare, an organization that donates food and resources to food-insecure families. Chirba Chirba Dumpling is one of the featured trucks on Wednesday. Chela Tu, who works for the truck, said she expects a high turnout at the rodeo. The Chirba Chirba truck is featured at Cliff’s Meat Market on W. Main St. every Sunday afternoon. 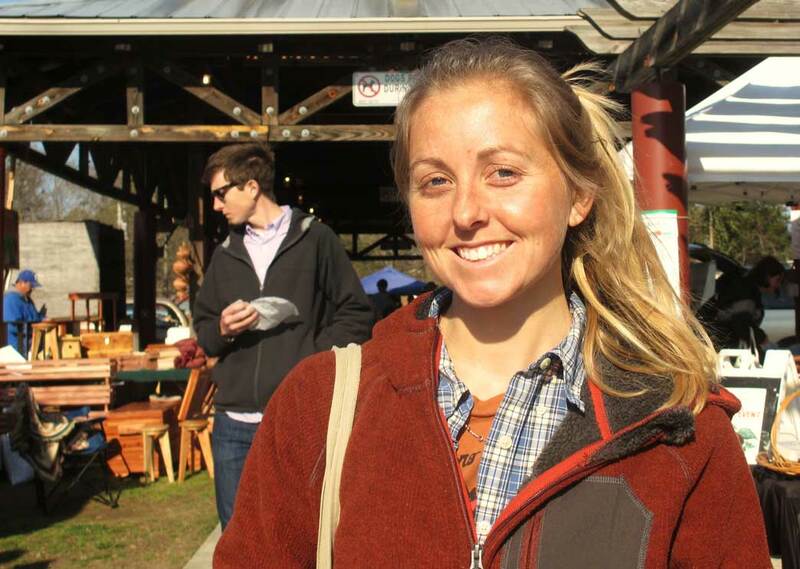 Tu, a previous resident of Carrboro, said she’s a big fan of the Carrboro Farmers’ Market. “I used to go all the time when I lived there,” Tu said. “I loved it. It turns into a social event— you get to know the farmers and shoppers. Heiderman said she thinks the food trucks will be a big draw on Wednesday. Heiderman expects 900-2,000 people will attend the opening, but said a lot will depend on the weather. “We’re hoping for sunshine, but we’ll be out there regardless,” she added. Staff editor for the Carrboro Commons.